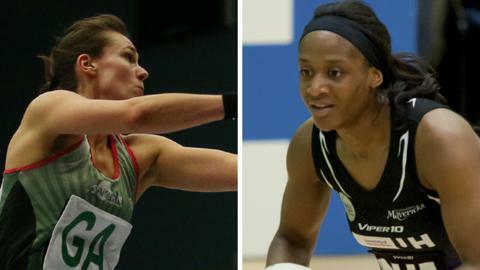 Celtic Dragons kept up the chase for the play-offs after they beat Yorkshire Jets 70-52 in round 13 of Superleague. The Welsh side moved to within three points of fourth-placed Hertfordshire Mavericks, who fell to a narrow 53-51 defeat by Surrey Storm on Monday. The Dragons will now have to beat Team Bath in Saturday's final round and hope the Mavericks lose heavily to the Jets if they are to claim fourth spot. Surrey, Manchester Thunder and Bath have already secured play-off places. Thunder's 66-55 win over Team Northumbria on Monday night means they have claimed a home semi-final. Tracey Neville's side will face reigning champions Bath, who made sure of third place with their 63-41 victory over Loughborough Lighting. Surrey, who are unbeaten going into the last game of the season, have also secured a home tie in the semi-finals, and will play whoever finishes fourth in the table. Speaking after their win over the Jets, Dragons player of the match Nic James told BBC Radio Wales: "We lost on Saturday [at Manchester] and a few of us were quite disappointed with the performance, but tonight we really gelled together. "It's all about performance and Commonwealth Games preparation for us this season but if we could get to get fourth position it would be absolutely fantastic." The Dragons made the final of Superleague 2013 but lost 62-56 to Team Bath in Worcester.